What has been called the “world’s greenest rally car” has been kicked out of its championship because it’s too fast. The gasoline-electric Honda Insight hybrid, which competes in Britain’s Formula 1000 rally championship, has been asked to withdraw following concerns from rival competitors that it has an unfair advantage, after dominating the 2011 series with two wins and a second place from the first three rounds. The car, which uses a tuned gasoline-electric hybrid system to give it more power and better fuel efficiency, has been developed by the Oaktec team from Lancaster over a six-year period using the low-emission Honda car as a base. The developments of the green technology have been so successful that the eco-car, which can return 2.8 L/100 km when driven slowly, has blown away a field of conventional rally cars to gain a 19-point championship lead after just three rallies. The championship organizers phoned the Oaktec team to request that it stand down from the series and compete the car in a higher class to appease rival competitors. The team has agreed to the demand and will now look to race in other classes. “It was a bit of a shock when I got the call as, after six years of hard work ,we finally had our chance for a bit of glory,” says Oaktec boss Paul Andrews. “But I fully understand the perspective of the organizers and their wish not to spoil the sport for the other drivers. Formula 1000 is a great championship and they were really supportive by allowing us to compete with these new hybrid technologies in their rallies and we always agreed that if we had a clear advantage we would step aside. 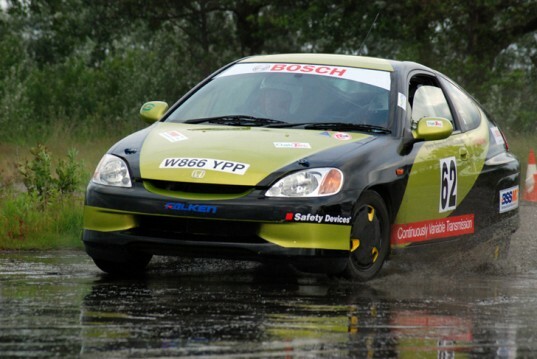 To prove the eco-credentials of the tuned Honda hybrid system, Oaktec entered the rally car in a fuel economy competition and returned 3.45 L/100 km, beating the next best car, a small diesel, by almost a litre per 100 km. It has regularly returned less than 2.8 L/100 km in testing and has ultra-low CO2 emissions, yet uses the same combination of efficient engine, batteries and electric motor to win rallies. In addition, the car is unique in motorsport because it uses a continuously variable transmission developed by Bosch, who also sponsor the car.